Time is up now is the time - right now - no more delays - demolition day is upon us!! Right now is the very time God is demanding our utmost devotion. Heart and soul - in all respects - in toto - utterly and totally. Jesus didn't die for lukewarm devotion - He didn't die to share His life with anything or anyone else! What idols have you got lurking there - This had me thinking really hard and I know God wants to change all of us bumping us out of our lethargy and making us His Warriors and new creations in Him. This is a new day - a new time - the old has indeed passed away and the new has come in Jesus - we need to know for sure that there are no idols not even ME in there anywhere - we need to live our lives wholly and solely for Him. When we think of idols we can't help thinking about wood and stone images set up and people falling down and worshipping them - sort of the like the golden calf in the wilderness all those years ago. There was a god of the Philistines mentioned in the Bible - Dagon was it's name - fierce looking thing - a fertility god I think it was - huge beast of thing. The Israelites had been defeated by the Philistines and they had captured the Ark of the Covenant (God's very presence) and had lain the Ark in the temple of Dagon - I guess it was like a trophy for these poor deceived people. The next day the huge idol was found lying prostrate before the Ark - so the dutiful people hauled it back up again and there it stayed throughout the day BUT the next day it was once more lying prostrate before the Ark. This time however, it's head and hands were severed lying on the podium in front of the Ark. Then of course there is the amazing and gobsmacking story of Elisha and the prophets of Baal and their contest on Mount Carmel - such a dramatic example of the power of God and His intolerance of anything or anyone that comes before Him. Of course idolatry extends to far more than the worship and of stone and wooden idols - our very lives can be idols that we place in front of God. We are living in uncertain times and more and more I am aware of how fragile life can be and I want to live for Jesus - he is far more than words on page or some history book written and studied - he is far more than just a story and because he is who he is - he deserves far more than lip service from us who call ourselves Christians. God needs to be EVERYTHING to us - far more than our dollars - far more than our families - far more than anything that we put in front of Him. Idolatry lives inside of us - in our heart region - our very souls need to be controlled by the only ONE who can change us. Our Hearts need to be where God is - We need to be singing from the same page as Him - He needs to change us radically and permanently - to rid us of any and all idols that lurk in our lives. Idolatry ultimately leads to rebellion against God and he will not ever tolerate it - we can't be serving our own aims and goals and still be called his servants. Surrender control to God - Now is the day to say Yes to Him - He needs to control everything. So today is "Demolition Day" - the day we demolish anything and everything that comes up before Him that isn't dedicated and sacrificed to Him. Let's look deep inside our hearts and souls and give to God complete and utter control handing everything over to Him - no idols of any sort. What is honestly controlling your life right at this moment? maybe unforgiveness, maybe jealousy, maybe self-centredness, maybe pride, maybe money, maybe family, maybe job security - the list continues. The Bible screams out to us of the sin of Idolatry and that God and He alone is the only one worthy of our worship. Idolatry robs God of what is rightfully His - His place in our lives - He will not tolerate second place. My prayer for us all this week is that God will show us through His grace and mercy just where our idols lie and will give us the boldness, strength and courage to demolish them entirely and permanently from His throne. 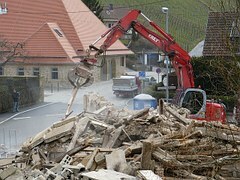 God bless you as you embrace Demolition Day in your Life - and may His peace and joy reign in your life as you live for Him.